Why Printronix High Impact Spool Ribbons? You rely on high impact printing to get the lowest cost of any print technology. That�s why we still support our legacy products with quality supplies. Our legacy high impact printers and ribbons continue to deliver significant cost savings, and are formulated for high yield, dark, or high definition barcode and text printing. 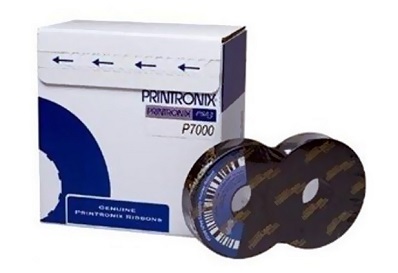 Click here if you need Cartridge Ribbons for your Printronix P7000 and P8000 Line Printers. The P7000 line matrix ribbon family gives you choices to suit your budget and print volume. Printronix highly reliable line matrix printing ribbons give P7000 users the lowest cost per page, darkest print and longest life. These ribbons contain the necessary ingredients to be read by infrared OCR and barcode scanners, and produce sharp high-contrast barcodes and text. Priced to match your print volume and budget, the new ribbon packages offer more options for cost-effective purchasing. Ultra Capacity � This ribbon has been the gold standard for years and continues to offer the same benefits as before. It is a workhorse solution for most report and label printing applications. Ultra Capacity Plus � These ribbons offer the lowest total cost of printing, longest ribbon life and fewest user interventions. This ribbon is designed for higher-use customers in manufacturing, back office applications and any application using high-volume batch printing. Printronix provides ribbons to meet the needs of all your specialty applications. These ribbons are manufactured to the same exacting specifications as other Genuine Printronix ribbons. Options include security and label ribbons. Yield 30,000 pages - for P8000 and P7000 Line Printers (1000, 1500 and 2000 LPM models). Yield: 90 million characters - 13,000 pages, Text and Barcode applications.